Located in southern Arizona, only 65 miles / 104 km from the Mexican border, Tucson is an intriguing, out-of-the-way city with excellent travel options and commendable visitor facilities. 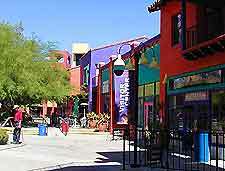 Although large, Tucson is accessible and easier to get around than Phoenix, with the city's attractions being plentiful. There are things to do here for the entire family and the stark desert is only a stone's throw away. 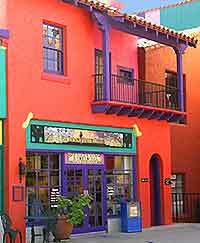 Although the main visitor center in Tucson is an excellent resource for information on Tucson, there is no substitute for researching the place before you arrive and the Internet is one of the best sources of free information and travel tips. Numerous, up-to-date websites have invaluable information on Tucson, while free maps and guides of the city can be picked up from many of the city's visitor centers after your arrival, including the 'Official Visitors Guide'. Over 300 languages are spoken in the USA, including over 170 that are indigenous to the area with the most commonly spoken language being English. Many different nationalities are well represented in the state of Arizona, in the city of Tucson and throughout America. There are literally hundreds of languages spoken all over the United States of America. The most common language in Tucson, Arizona and throughout America is English. 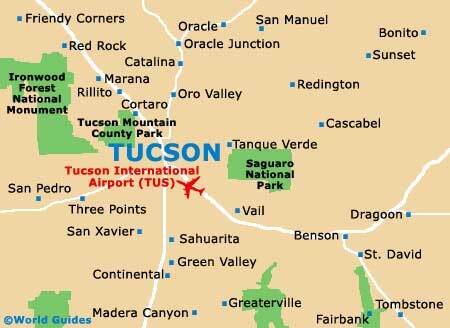 Prior to your arrival in Tucson, check with your nearest consulate or embassy to find out if you need a visa for travel to Tucson and the USA. Visa applications should be made well in advance. A range of categories for non-immigrant visas are available for those that plan to work in Tucson and the USA temporarily. Working without a visa is against the law in America and penalties are harsh. Those intending to work in Tucson should apply for the relevant working visa in their home country and may need some paperwork from their prospective Tucson employer. Currency in circulation today in Tucson, Arizona, is typical of the United States of America. The American dollar is the official currency of the USA and is also referred to as a 'buck'. Dollar bank notes in Tucson are generally called bills, in denominations of $1, $2 (unusual), $5, $10, $20, $50 and $100. The dollar is divided into 100 cents and coins in Tucson come in denominations of 1 cent (penny), 5 cents (nickel), 10 cents (dime) and 25 cents (quarter) and a 1 dollar coin. Tipping is commonplace throughout Tucson, unless service has been extremely poor. Restaurants in Tucson generally expect a tip of around 10 or 20 percent, as do local taxi drivers. Bars in Tucson often place special tipping trays or jars on the counter. Hotel staff in Tucson also expect to be tipped, which may be simply a dollar. When dining out in Tucson's numerous restaurants, you will find that most are now strictly 'no smoking'. Smoking is also no longer permitted on public travel options in Tucson.